Arsenal U18s fell to a shock 2-1 loss to West Brom U18s in the fifth round of the FA Youth Cup on Saturday afternoon. 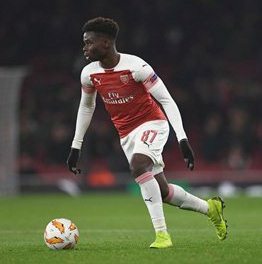 As many as six players of Nigerian descent started for Arsenal in the encounter at Meadow Park; while Arthur Okonkwo started between the sticks, Mazeed Ogungbo, Folarin Balogun, Xavier Amaechi, James Olayinka and Bukayo Saka were the outfield players on show. Balogun and Amaechi had early chances at goal shortly after they fell behind to a Jamie Soule's opener for West Brom while Saka rattled the crossbar with a fierce drive as the Gunners sought to restore parity. And just on the half hour mark, it was Saka that provided the much needed equaliser, latching onto a loose ball following a free-kick before firing past Baggies goalkeeper, Griffiths from close range. But West Brom eventually stole a winner through Azaz in the second period though there was still time for Balogun to head narrowly wide of the far post from inside the six-yard box in the 87th minute. Having overcome this hurdle, West Brom will now face either of Ayo Tanimowo's Brighton or Everton in the sixth round of the youth competition.